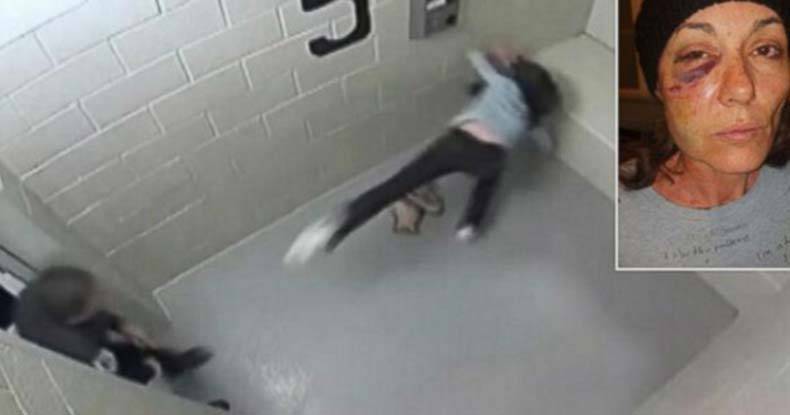 Skokie, IL — The village of Skokie recently agreed to pay $875,000 to a woman seen on jail surveillance video being shoved into a cement bench face-first. The officer admitted to fracturing her face because the nonviolent woman did not look directly at the camera during her mug shot photo. Arrested for DUI on March 10, 2013, Cassandra Feuerstein was found asleep in her vehicle at 6 a.m. when officers took her into custody. A surveillance video from the jail shows Officer Mary Escobedo ordering Feuerstein to take off her shoes and bra before processing. After complying with her orders, Feuerstein is ordered into the hallway by Officer Michael Hart to take her mug shot photo. A few seconds later, Feuerstein calmly returned to her cell when Officer Hart sadistically shoved her from behind into a cement bench across the cell. Slamming her head into the bench, Hart caused Feuerstein to fracture a bone in her face, loosen some of her teeth, and slice a cut across her cheek. Collapsed into a fetal position, Feuerstein wept over a pool of blood as Hart took one look at her before immediately fleeing the room. Officer Escobedo returned to give Feuerstein bandages, while another officer cradled her bleeding head in his lap. In addition to the DUI charges, Feuerstein was also charged with resisting arrest. In his police report, Hart added the resisting arrest charge because Feuerstein was not looking directly at the camera during processing. Requiring reconstructive surgery and a titanium plate in her face, Feuerstein eventually pled guilty to DUI after the State’s Attorney agreed to drop the resisting arrest charge. Feuerstein also filed a lawsuit accusing Hart of filing a false incident report to justify his use of excessive force. With the surveillance video blatantly showing that she did not act aggressively or threaten anyone’s safety, Feuerstein won both a judge’s ruling and a settlement agreement that together amount to an $875,000 payout. Several months after the incident, Cook County State’s Attorney Anita Alvarez charged Hart with felony aggravated battery and official misconduct. Pleading guilty to the misconduct charge, Hart was given probation with no jail time. After the village announced termination proceedings against him, Hart resigned from the department.